Coca Cola reported spending almost £3.3bn on advertising in 2013 – but there are very few businesses that have marketing budgets on that scale. Content marketing is the process of creating, curating and distributing useful, valuable content that engages, inspires and attracts existing clients and potential customers. It can take a wide variety of forms including blog posts (like this one), videos, how to guides, opinion pieces, podcasts, white papers and more. It should help drive awareness with your audience and reinforce and promote your brand message. Content marketing is not a new tactic but it is an extremely important one and getting it right is a huge challenge for any small or growing business. Prospects typically don’t engage with sales until they’re almost 60% of the way through their buying cycle, according to CEB research. What were they doing during that timeframe? A large proportion of this time is spent consuming content online, underpinning just how vital it is to deliver compelling content marketing. You need to ensure any content you produce, whether it’s an e-book or a web page, helps them make up their minds. Getting it right can mean you start generating leads for free, time and effort aside. Content marketing can make a big contribution to improving your lead flow without throwing money at advertising. Of course, there’s no point adding great content to your website if nobody can find it. Your content needs to be highly visible on Search Engine Results Pages (SERPs). Ranking highly in search engines can be challenging as the competition is both immense and intense. But it is possible, especially for niche businesses or niche search terms. A great start is to get into the mindset of a searcher. Make sure you include words that your customers are likely to be searching for (rather than your own internal language and jargon) and include them (where appropriate) on your web pages. Over the years Google and other search engines have become a lot smarter. They now do a much better job at understanding the context of searches and the searcher intent, so it’s no longer good enough to have a keyword appear 50 times on a page. Changes from 2011 onwards have been paying close attention to the quality of content in order to deliver the best available search results based on user queries. Your content needs to provide searchers with some ‘unique value’. Whether the uniqueness comes from the content, an opinion, or the way it’s presented, is up to you. But ultimately, your content needs to be more useful to searchers in some way than the alternatives. Quality content that supports searchers and answers their questions is going to have a much better chance of ranking highly than a very salesy or branded product page. For example if somebody was to Google ‘CRM’ what would they expect to find? CRM solutions, sure, but maybe they don’t know what CRM is. They might expect to find the answer to ‘What is CRM?’ or the benefits of CRM, or something altogether different. It could even be an acronym for an entirely different concept, company or technology. The best brands use content marketing, then, not to ram products down prospects’ throats, but to publish content of real interest to them. They use content marketing to help their target audience solve problems, work smarter, and stay up to date on changes in legislation, technology or their own industry. Providing content with unique value is a huge step in the right direction. When coupled with on-page search engine optimisation and some promotion, your content has the best chance of ranking well. The higher you rank, the more likely you are to increase your website visitors and awareness, and in turn your leads and sales. By creating truly great content and ensuring you optimise for search, you can create a virtuous circle driving business opportunities. Email marketing remains one of the best low-cost lead generation and lead conversion techniques for SMBs. With a list of people to market to and a system to mail them, this tactic can play a powerful part in the nurturing process, continuing to engage existing customers and re-engage prospects that have gone cold. It can deliver subtle nudges about your products and services so you are front of mind when recipients are considering buying or have been asked for a recommendation. Email marketing can be particularly effective for generating new leads from existing customers with whom you already have a relationship and knowledge of their business. That’s because it provides a way for you to show what else your company has to offer: it’s always far easier to cross-sell or upsell new products or services to an existing customer than it is to come in cold and make a sale to someone you have no previous business relationship with. Also, don’t forget that a prospect that has gone cold is still a prospect. A carefully crafted email may be just enough to remind them of what you have to offer and rekindle a potential business relationship. To optimise campaign performance, make sure you test things like the frequency of your emails, the day and time that you send them, which kinds of emails get the best open and clickthrough rates, and – even more importantly – which emails are converting people to leads and sales. Social media has changed the way customers interact with businesses and their products. Companies can now build relationships with customers, customers have a very public medium to complain about poor products and service, and crowd-sourced review sites enable potential customers to research what people are saying about products they are interested in. The buying process has changed significantly. Whereas in the past, potential customers may have learned about your products from advertising directed at them, or via your website, social media allows them to find out more about your company, your products and your reputation from others – and make their buying decisions accordingly. Although this could be seen as a challenge it also provides you with a unique sales and marketing opportunity. It can be the ideal place to influence prospects’ buying decisions and turn them into paying customers. By providing great products and service to your current client base, you can create online brand evangelists who will sing your praises, like word of mouth but with a global reach. While it’s unlikely social media will drive hundreds of leads directly, it will result in some, not to mention the knock-on effect on brand awareness that can be a much bigger influencer of lead generation. Social media provides opportunities to start conversations, engage prospects, and demonstrate expertise. You can build trust with those you are talking to but also with anybody else who comes across your conversation. You have the opportunity to directly connect not just with customers, but also influencers and experts – all of which can reflect well on your brand. It can also help generate qualified leads for very little cost. Social networks collect a myriad of data including demographics, interests and more that businesses can leverage to target their communications and promotions to specific and relevant audiences. LinkedIn: With over 15 million professionals in the UK using it, LinkedIn is the perfect medium for B2B marketers to reach the right people within the specific companies or industries they are targeting. There are a number of ways to generate leads at zero cost on the site. For example, you can reach out and engage directly with people via InMail or connecting with them, you can get introduced via mutual connections and you can also post updates and target people based on a number of variables, from role and job title to seniority and company size. Facebook should be a major focus for any B2C business because, with almost 1.5bn active users monthly, it’s the place where the largest number of consumers congregate, share views and experiences, and keep an eye on the brands they like. That means it’s a key place for potential buyers and existing customers to find you, and having a presence there puts you right in front of those customers. And because it’s B2C people are more likely to impulse buy, so if you get your social media marketing right here it could lead to a lot of sales. Twitter is also a key social network, although in terms of scale it has just 20% of the active monthly users of Facebook. It can be a great place to demonstrate thought leadership for both B2B and B2C businesses. It’s also a great platform for your brand to express some personality, and the perfect place to demonstrate your responsiveness to customers in a highly visible way. Although Facebook, Twitter and LinkedIn are the most commonly used social networks within businesses, there are so many others you can leverage, depending on your business and the kind of people you’re trying to reach. YouTube is great for showcasing product demo videos and how-to guides, while Pinterest and Instagram can work really well for design and visual businesses – for example a florist providing displays for corporate receptions. Some professionals and consultants will respond to relevant questions on Quora to demonstrate their expertise in their reply, both directly to the questioner and to anyone else reading the thread. And Slideshare is another good space where you can share expertise and re-purpose content that you have created elsewhere to create interest and generate potential sales. You should also check out how other businesses use social to get an idea of best practice in action. For instance, Rentokil’s blog has articles written by its experts to entertain and engage users, like Can cockroaches survive a nuclear blast? Smaller businesses, if they are to survive and thrive, need to implement a strategy for generating leads that don’t cost a small fortune. A great strategy is to focus on the online world: by nailing content, email and social media marketing you can generate the sales leads you need to grow your business quickly – without breaking the bank. 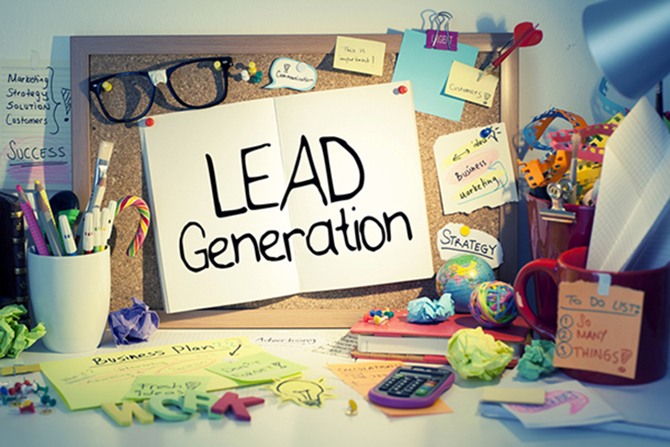 Lead generation can affect your business’s success even before you have officially launched. At Start and Grow Enterprise’s Start-up Weekend you’ll learn affordable prototyping and market testing ideas that will work for your business. Copyright © 2000-2017 salesforce.com, inc.